This module features an Ethernet interface, which solves most common problems with COM-ports and USB configurations. The circuit is mounted on a professional, double sided PCB with silk mask. DB9 connectors are used because of their toughness. The DB9 connectors are supplying 12V power for the CBUS network. This computer interface has, like all other CAN-GCA modules, a jumper for terminating the CAN data line with 120Ω. The board features an ICSP connector for (re-)programming the CPU. Check http://www.phgiling.net for boards and Kits. Max. 4 concurrently TCP/IP connections. Connection timeout after 100 seconds idle. FLiM Setup for Node number, IP address, service port, MAC address, network mask, CANID and idle watch dog. 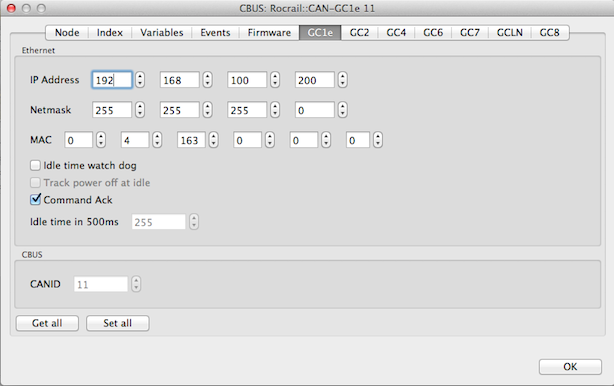 PC protocol is compatible with CANRS and CANUSB. 4 Learning mode 500ms blinking Activated by push button or Rocrail setup. 4 Error One shot long DIM Ethernet or CBUS Queue full. Socket not ready. 4 Disconnect One shot DIM A client, e.g. Rocrail server, has disconnected. 4 Read/Write variable One shot short DIM During setup with FLiM. J5 MERG CBUS with 12V connection. JP1 120 Ohm terminator on CAN line no terminator on Can-line Only 2 far ends of total communication line should be terminated with 120 Ohm. On J1 a power supply of 10-20 V AC or 15-24V DC can be connected. For DC supplies: Polarity is irrelevant. Minimum capacity should be 30 VA.
Supply for all CAN-GCx units should be standard 12V. This can be adjusted with POT1, to be measured on J5 pt 1 & 4. It might be necessary to set a higher voltage, special for use with CAN-GC3 programming track. Some decoders may need a higher voltage to enable a correct reading. Voltage is adjustable between ca 12 and 18,5Volt. The best way to program the firmware into the chip, is leaving the eeprom blanc, i.e. all 0xFF. In that case , the standard IP-number, Netmask and Mac are set as below. Reset to these values is also possible by pressing the button on CAN-GC1e while powering up. The CAN-GC1e can only be configured over Ethernet. The usual way is to connect CAN-GC1e to your home network. A direct link will mostly work too but in some occasions a router or Ethernet hub seems to be needed. The default IP address of the CAN-GC1e is 192.168.0.200. Make sure the PC is also in the same network range of 192.168.0.x before trying to connect. Your PC gets usually its IP4 address autmatically from your home router. This might be different form 192.168.0.x. In that case, write down the IP4 number where your PC is running on. Now Rocrail should have connection with CAN-GC1e. the four numbers to a different one between 1 and 255 as shown in example above. Then press button on CAN-GC1e, causing the leds on the board flashing. Press SetAll button in Rocrail screen. New address is now stored in EEprom on CAN-GC1e. It will only be active after restart CAN-GC1e. Now change IP-address in Rocrail settings command station, and shut down Rocrail. Do not forget also to shut down CAN-GC1e. Put PC-Network settings back to automatic IP Address. If for any reason you like to go back to standard IP-Number 192.168.0.200, all you have to do is restart CAN-GC1e with button on GC1e pressed. All Ethernet settings are written into EEProm and will be activated after a re-power on except for the "Idle time watch dog". The default setting of the Interface’s IP address is 192.168.0.200 with the service port 5550. You may have to set your PC Ethernet connection to this address range, 192.168.0.x, in order to be able to access the Interface. Default is 255.255.255.0 which will do for all home and club networks. The default MAC address, which is not an official one, can be changed if it conflicts with an existing one in the network. Note: The CAN-GC1e must have a valid MAC-Address. Otherwise, some routers or access points may refuse a connection to that device! In some cases the connection can be possible over LAN-Cable, but not over WLAN from the same router. 00-00-00-00-00-00 is not a valid address. The idle time watch dog disconnects a client if it did not send anything within a period of 100 seconds. This is to avoid zombie connections which will unnecessary occupy a TCP/IP resource. Disable this option if sniffer software is connected. Rocrail sends every 2 seconds, in case no other command has been send, a keep alive message to the CAN-GC1e. This message is not broadcasted to the CBUS and serves only for resetting the idle timer in the CAN-GC1e for this connection. The idle watch dog must be activated for this option. Useful for running in automatic mode to turn off the power if the client has turned idle. Use this option only in case of data loss. Activates the command acknowledgment of each received command on the Ethernet side. Unique ID in the CBUS network. The CANID is not used from the ASCII Frames because more then one PCs can connect using different IDs. The CAN-GC1e Firmware supports up to 4 concurrently connections. Keep in mind that commands send from one connection to CBUS are not broadcasted to the other connections. This is the normal behaviour because all commands send by a CBUS node are not seen by this node itself. Only packets coming from other nodes in the network are broadcasted to all connections. Strongly discouraged and not supported is the use of a wireless connection between the Rocrail server and the CAN-GC1e. Avoid streaming data like VoIP on the same network segment; CAN-GC1e will stop service after too many retries. The standard 12V, coming from CAN-GC1e , is used for programming track as well. it seems that some decoders have a bit of a problem with that. To solve that, a higher Voltage will be the solution. For this reason, the VR1 regulator on CAN-GC1e can be swapped with a LM2576T-adj type. Pot1 on CAN-GC1e is already there and in that case can be used for adjusting the output between 12,5V and 18,5V. CAN-GC1e will be equipped with the mentioned regulator from this day on.